Thanks for all the suggestions on what to do with the domain name situation. For now I’m going to keep the WordPress domain and just mull over name changes and etc. I may just link the blog into a professional domain based on my name as a way to pull everything–my freelance writing, CV, baking, and blogging–together. Lots to think about! As for right now, it’s perfectly acceptable to come home from a day of teaching middle schoolers, throw on PJ pants at 4 in the afternoon, and curl up with a cat, right? They really take it out of you! My cat, for one, isn’t complaining. In fact, he looks the happiest he’s been in awhile, but I’ve got to stay on track, stay focused, talk about how awesome these graham crackers are. You see, tomorrow’s my birthday. And I’ll be working, of course (substitute teaching high school music–should be a trip! I’m hoping for a “let’s watch a movie” lesson plan), but afterward I have plans to eat amazing Mexican food and then go bowling with my friends. But not just bowling–no, bowling with a pieluck, a pie-themed potluck of sorts. I mean, cake was so yesterday, right? But I can’t show up empty handed to said pieluck. In fact, baking for my birthday is what it’s all about. I love to come up with something creative and challenging every year, and this year, I believe, is no different. I’m going to leave you in suspense about the final product, but for the time being I will tell you that it’s going to be gluten-free, vegan, soy-free, and, perhaps, sugar-free. I haven’t decided on the sugar thing, I’m not sure if agave will sweeten the filling as much as I want, but I might give it a whirl. For said pie though, I needed a graham cracker crust. 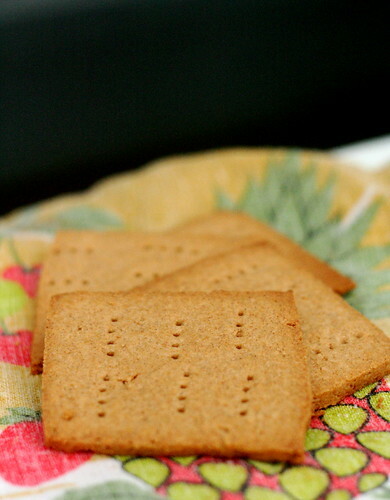 Luckily Shauna at Gluten-Free Girl and Chef recently posted a recipe for gluten-free graham crackers–and they’re not only gluten-free but also sugar-free, something I found really intriguing. I normally don’t balk at sugar, but after going through (well, I’m technically on the last day today) a 10 day diet/cleanse, I ought to watch my refined-items intake. With agave sitting around, I subbed it for sugar with fantastic results. These crackers are definitely not as sweet as the store bought variety, but I like that. If you’d like to go sweeter, sub sugar back in–I think Shauna proposed some ratios with her recipe, so you can give those a whirl. But for right now, the graham crackers. While definitely less sweet than the norm (something easily remedied by adding a cinnamon sugar topping if you’re going to eat them as-is), they pack the perfect crunch and nuttiness I like in a graham cracker. The flour combo is also superb–not too grainy or beany. I definitely sneaked a few of these while they were cooling, putting peanut butter on some, apple butter on others and, yes, they were perfect. Measure out the sorghum, brown rice, tapioca, and sweet rice flours into a large mixing bowl. Add the cinnamon, baking powder, xanthan and guar gums, and salt. Mix with a large spoon until everything is well combined. Cut the butter into small pieces (about 1/2 tablespoon size) and cut into the flour with a pastry blender until fully incorporated and you have a mealy texture. Stir together the agave with 3 tbsp of the water. Add the agave mixture to the dough and work with a spoon until well combined. The final dough should be soft and pliable, even a bit wet. If it still has not come together entirely after a few minutes, add the remaining cold water, a tablespoon at a time. Divide the dough in half. With the one half, roll between 2 sheets of parchment paper, roll the dough out until it is 1/4″ thick. Cut the dough into equal sized pieces. Place the crackers on an oiled or parchment lined baking tray. Repeat with second half of dough. Refrigerate for another 15 minutes. Meanwhile, preheat the oven to 325 degrees F. After the crackers have chilled for 15 minutes, remove from oven and poke holes in them with a fork (in whatever pattern you like). Bake for 15-20 minutes, until golden-brown. Allow them to cool on the baking tray for at least 30 minutes so that they harden properly. Happy birthday! Have fun bowling! happy belated bithday, Jes! i hope bowling and pies and mexican eats were all super stellar! i hope your day was full of everything you love the most, too! i’ve gotta make these crackers, and i like that they’re not overly sweet – they sound perfect! i can’t wait to read about the g-f, soy-free, and maybe sugar-free pie. ooooh, yum! i bet it’s gonna rock some socks. i think i would curl up and cry had i to teach middle schoolers. i’m not good with kids (although i really do try) and i remember how i was in middle school. ah ha ha! pjs and cat cuddling after work is pretty much what i do, and i don’t teach – you deserve the break & relaxing time more than i do (i just sit at a desk all day)! anyways…..i hope your birthday was the best, & full of friends, love, hugs, and laughter! These grahams look mighty fine, Jes. And a happy belated birthday to you! I can’t wait to see what kind of pie you used these in for your “pieluck” party, which sounds like it will be a fine time. I hope you had a great birthday! Bowling, how fun! I haven’t been in years, maybe 13 years? Geeze, that’s a long time. I WILL be making these this summer for s’mores. Thank you! And screw gluten-free girl, she writes a pork blog.